Photos: The early days at Siphone's computer shop; Siphone by the Nam Khan river in Luang Prabang. Siphone has been part of Big Brother Mouse right from the start. 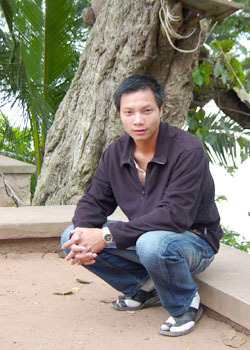 While Siphone was a student at Teacher Training College in Luang Pragang, Sasha brought him three used computers from Thailand, which Siphone installed in his bedroom. The idea was to make computer time available very cheaply to other students. Originally, Siphone expected that students would use language software on the computers, to improve their English skills. Demand was slow at first but Siphone stuck with it, spreading the word, and experimenting with different approaches. Eventually it became clear that students were more eager to learn computer skills that could help them in the job market: word processing, spreadsheets, and Photoshop. Siphone changed the shop's focus. He wrote simple textbooks in Lao to teach those skills, and business grew. He's now expanded to a larger building, with 10 computers, a small library, and movie time on weekends – often the high point of the week for students who work full-time while going to school. Siphone's first employee was Khamla. They had been novice monks together, and were still close and trusted friends. Sasha and Khamla, who later formed Big Brother Mouse together, met at Siphone's shop. Siphone's second employee, Khout, now runs the Big Brother Mouse shop in Luang Namtha. Siphone wrote two of our first books. He collected four traditional Lao folktales in The Cat that Meditated. Then he wrote Baby Frog, Baby Monkey, a rhyming book about animal babies. Those were followed by an alphabet book, Funny Letters, and three forthcoming books: Another collection of traditional Lao folktales; a book about how the digestive system works; and Siphone's Thesaurus, which we believe will be the first thesaurus in Laos.